There they are. There they stand. They have my back. Like my own mini Terra Cotta Army, on days when things seem too complicated, and it’s hard to separate work from life, they provide a strength and calm more powerful than Qin Shi Huang. 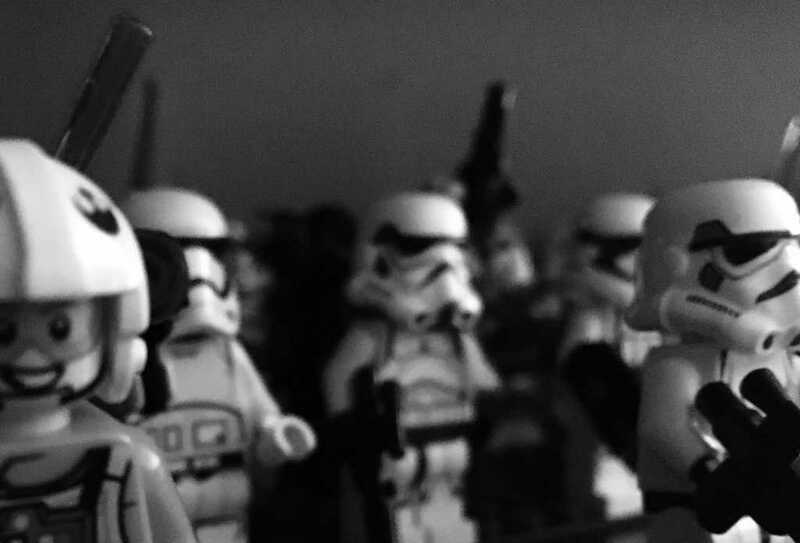 They are my LEGO Star Wars Minifigure army, and I am never alone. Admittedly, the above lede is a bit hyperbolic, but there’s more truth to it than I’d like to admit. Sure, I know that I’m not the only Star Wars fan who – when consistent “adulting” becomes hard – hits the bricks for an escape. However, they are toys and sometimes it’s hard to admit that your 10-year-old self still co-exists in a 42-year-old head. Mostly due to space issues and cost, my collection is very modest, populated mostly by recent Minifigures and Microfighters; these are easy projects which make my children happy in the moment but are easily moved to a shelf once the kids have moved on to the next big thing. However, there are those whose skill and patience and capacity are impressive. Most impressive. My friend Jeff is emblematic of those Jedi master builders–a person who has taken a childhood full of memories, brought them forward into the present and used them to build anew. “Build what?” you ask. Per Jeff, he builds peace, patience, and paternal love as he puts pieces together for his own personal Star Wars galaxy. “I built Legos my entire childhood, back then it was all the pirate ships,” he said on a snowy Central Massachusetts afternoon; a Sunday made for LEGO. “My older brother was very into the knight and castle Legos so that’s what introduced me to them. “I eventually grew out of playing with them when I became a teenager and put the hobby down for years,” echoing so many of us when we talk about childhood passions. “My wife bought me my first Star Wars set (an AT-ST) for our one year dating anniversary when I was 23, never knowing it would develop into the hobby it became,” he continued. “The intention was never to have a giant collection, but I had so much fun building that one set it brought back all the fond childhood memories. It became a ‘just one more’ situation where I’d buy another one, then another, until I needed to build an elaborate shelving system. That’s good because Jeff is having issues keeping his little galaxy from overtaking the house (and allows me to overtake this space on the site). Listening, I imagined a situation like Jason and Amanda Ward, where the entire family has their hands in the saga (albeit brick-borne in this case). But no, it mirrors my scenario and no doubt many situations around the world. But, perhaps because he exercises control over his passions (like any good Jedi), there’s no controversy about the craft, either. “My wife doesn’t mind the hobby at all; she actually encourages it because she knows I enjoy it,” Jeff explained. “My older son loves LEGO, too, and will sit with me and help me build. It’s a fun way to spend time together. Like many Star Wars fans, Jeff is not heavily into Episodes I, II, and III. So, maybe he was saving this prequel-era geek’s feelings when he alluded to putting some sets away. “I was introduced to the series in the buildup of the Special Editions back in 1997,” explains Jeff. “Up to that point I had only seen parts of the movies on TV, but never watched them in full. “For my 12th birthday, I was given the VHS box set and watched them all in one day. After that, I was hooked. This was the summer I moved to a new town and made all new friends, all of which were already interested in Star Wars. I was a huge fan of the Star Wars Collectible Card Game in 7th-9th grade until it was no longer ‘cool’ to play anymore. And I still have all those cards in boxes in my basement. “We saw all the prequel films in the theater,” he added. “Although I don’t hold those in the highest regard now, I loved them when they started coming out (I was 13 when Phantom Menace hit the theaters). Jeff’s appreciation for Rogue One and The Force Awakens is no doubt bolstered by his ability to physically rebuild those scenes. I, for one, always imagined being one of the visual effects people or animators who could create a whole new universe from scratch. 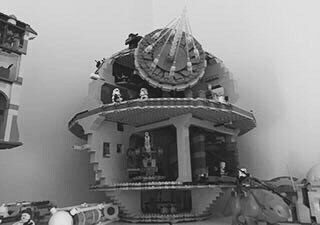 Thanks to the Lego Star Wars series, fans can immerse themselves and give their mind a little space – pun intended. “If I have a new set I’ll build it ASAP,” said Jeff, no doubt echoing many of our fellow collectors. “I have time after work and dinner and my son and I will work on them together. Then, I’ll usually keep going after he goes to bed. “I make sure to not 100% complete it while he’s in bed. So, he can be part of the finished product the next day. I do find it to be a stress reliever. To me, the fun is building the sets, I don’t actually play with them. “Occasionally, if I’m bored, I’ll take apart a set and then rebuild it,” he said. Unlike many collectors, Jeff generally earns his sets and is never sure when his next build will begin. “It really all depends, I’m usually good for a set or two for Christmas and my birthday,” he said. “For my 30th birthday, everyone gave me Legos, which is when I got the Death Star, Ewok Village, and Ghost. As for Jeff’s Lego building bucket list, he brings it back to where the saga began. 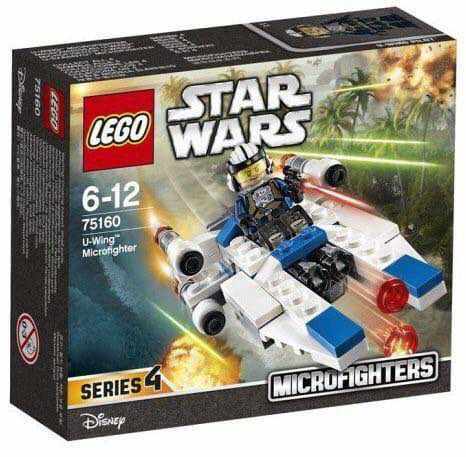 Me, I’d settle for the U-wing Microfighter.